Hungarian cantor; born in Hrabócz, Hungary, March 7, 1823; died in Budapest Aug. 29, 1891. Up to 1848 he filled several positions in minor provincial congregations. At the outbreak of the revolution in that year he enlisted in the Hungarian army, and participated in the campaign against Austria. 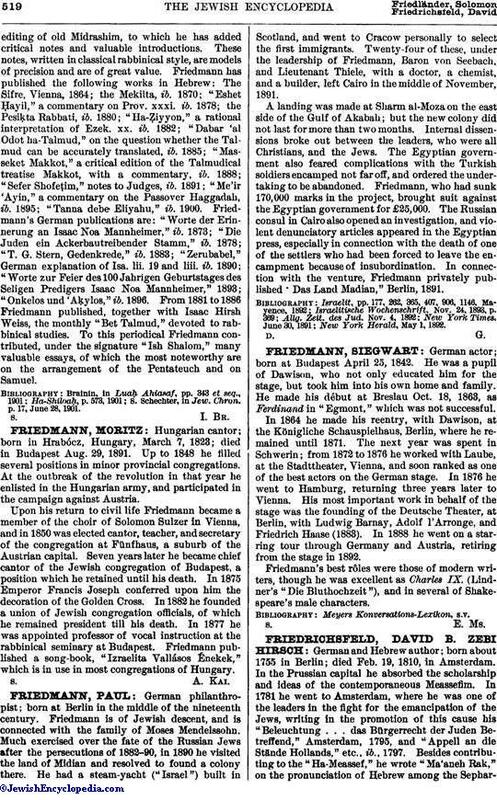 Upon his return to civil life Friedmann became a member of the choir of Solomon Sulzer in Vienna, and in 1850 was elected cantor, teacher, and secretary of the congregation at Fünfhaus, a suburb of the Austrian capital. Seven years later he became chief cantor of the Jewish congregation of Budapest, a position which he retained until his death. In 1875 Emperor Francis Joseph conferred upon him the decoration of the Golden Cross. In 1882 he founded a union of Jewish congregation officials, of which he remained president till his death. In 1877 he was appointed professor of vocal instruction at the rabbinical seminary at Budapest. Friedmann published a song-book, "Izraelita Vallásos Énekek," which is in use in most congregations of Hungary.